Ambassador Hotel's Website - Sencia Canada Ltd. Located in Kingston, Ontario, The Ambassador Hotel provides restful accommodations and includes a large waterpark with slide, meeting and event rooms and delicious foods from JM’s Restaurant & Lounge. 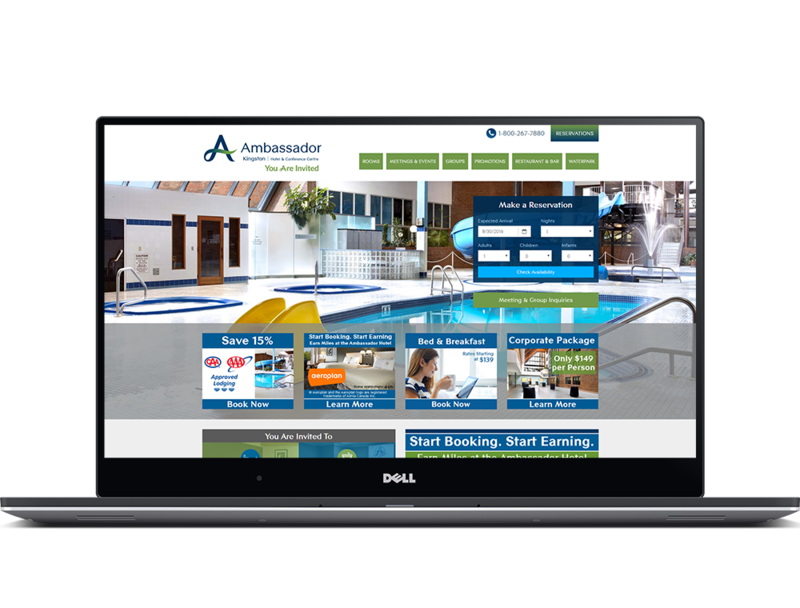 As part of Airline Hotels, Kingston’s Ambassador Hotel wanted a clean new look for their hotel’s website that would be up-to-date with current web standards. The company had just refreshed their branding to a cleaner, bolder look with deep blue and green hues. The new branding needed to be incorporated into their website as well as their new online reservation system and featured promotions. 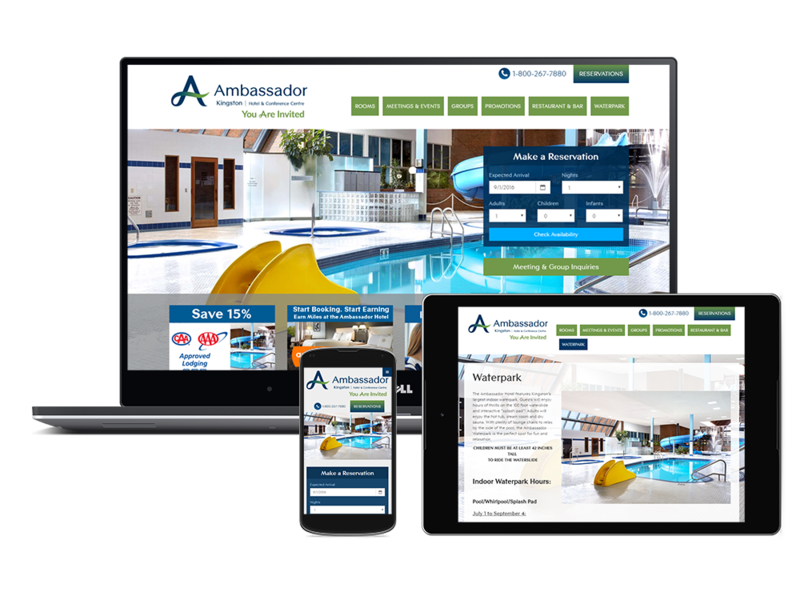 Sencia worked closely with The Amassador Hotel to craft and design a website that truly met their needs and requirements. We implemented their booking system ihotelier, which made it a smooth process for their guests to reserve a room directly from their homepage. Airline Hotels has a saying “it feels like you’re staying with family at our hotels” which can strongly be said about The Ambassador Hotel’s website. Visitors are welcomed by inviting imagery of their water park, lounge, restaurant and of course the comfortable guest rooms. 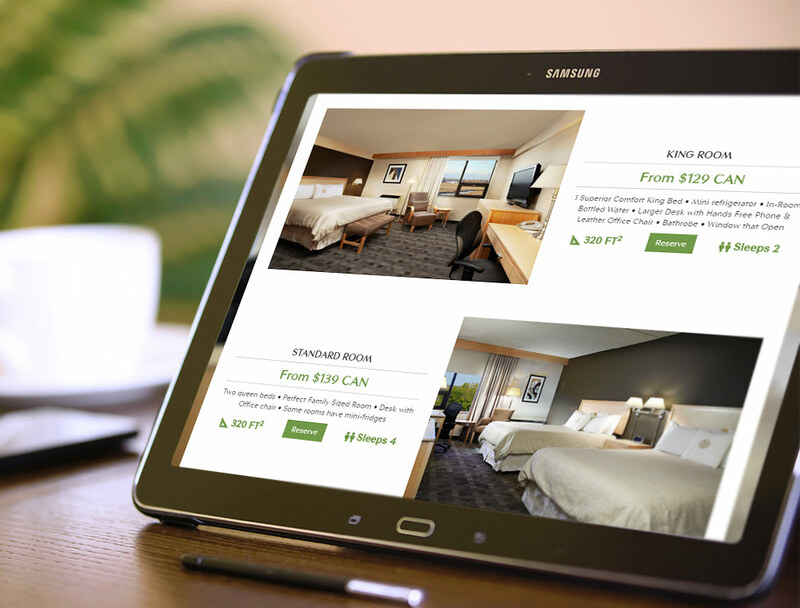 Guests can easily book a room directly from their homepage and indulge themselves in the warm and rich atmosphere of their hotel through large full width banners present throughout the website.